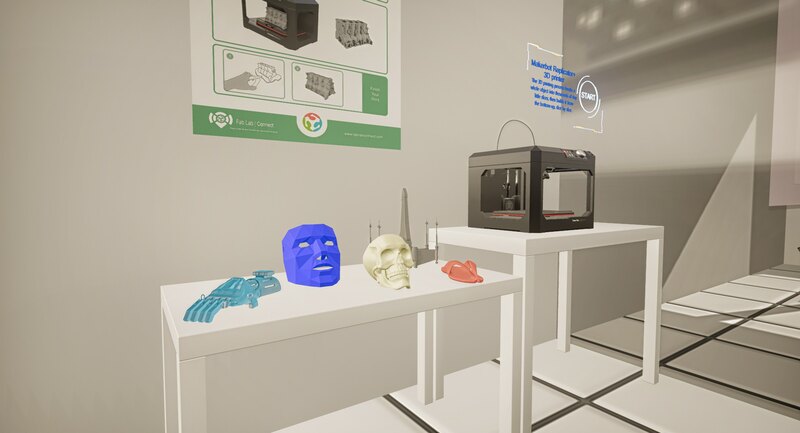 Explore and learn how to operate 3D printers and laser cutters in a VR environment. Building and creating using tools and machines such as 3D printers and laser cutters can be a valuable learning experience, but also is expensive and takes up a great deal of space. A virtual reality (VR) application can allow for some of the same experiences without the cost, with School Fab Lab VR. School Fab Lab VR has been created in attempt to give everyone the chance to experience a digital fabrication laboratory using VR. The software recreates an environment containing several workstations that allow users to interact with maker machines to learn how they are used and what is possible to create by using them. For people and institutions who wish to build their own makerspace, it allows users to understand the size of the machines, how big a space would be needed and what the best layout would be.